Recent data continue to suggest a softer first quarter in the US, but with the underlying fundamentals of the US economy generally solid at present, talk of an imminent recession may be a bit overdone. Absent some unforeseen shock, “talking” ourselves into a recession seems to be the most realistic way the US economy could experience one in the foreseeable future. Nevertheless, the economy is certainly losing momentum. A main area of concern is the consumer. Accounting for almost 70% of GDP, a large retrenchment in consumer spending would materially weigh on economic growth. Consumer spending data have been extraordinarily choppy in recent months, and the mixed February retail sales report served as the latest affirmation that the consumer is in a bit of a soft patch. Retail sales declined 0.2% in February, but January’s gain was revised more than three times higher than initially reported. Control group sales – which feed into the calculation of personal consumption expenditures in GDP estimates, also fell 0.2%. That nudged the three-month annualized rate to -2.1%, a rate not seen outside of a recession in the past 15 years. Equipment spending is also shaping up to be a weak spot in the first quarter, as US manufacturing activity is under pressure from slower domestic demand and the still-uncertain trade environment. Durable goods orders fell 1.6% in February, and while nondefense capital goods shipments rose 0.6%, the 1.5% drop in January suggests only a tepid pace of equipment spending in the first quarter. While the manufacturing sector still faces challenges, the ISM manufacturing survey allayed some fears that US factory activity is slowing dramatically. The ISM nonmanufacturing index, on the other hand, fell to a 20-month low in March. However, both the manufacturing and non-manufacturing indices remain firmly in expansion territory, consistent with the economy continuing to grow, just at a slower rate than last year. The employment picture remained positive. Employers added 196,000 jobs in March. While the most recent print was slightly stronger than expected, it still suggests that the overall trend in hiring is moderating from the robust pace of job growth experienced last year. But by just about any measure, the labor market remains exceptionally tight, adding to the view that a prolonged retrenchment in consumer spending remains unlikely. With the moderation in job growth, and wage growth showing no further signs of acceleration in March, it remains unlikely that the FOMC will alter its “patient” policy stance any time soon. Backing off a threat to close the US border with Mexico, US president Donald Trump instead threatened to impose tariffs on US-bound vehicles assembled in Mexico if Mexico does not do more to mitigate the flow of migrants and illicit drugs into the United States. Trump said that if the flow of drugs does not stop after a one-year warning period, he would institute auto tariffs and close the border. The Ways and Means Committee of the US House of Representatives this week passed the Secure Act, a bill intended to increase flexibility in 401(k) plans and improve access to retirement plans in small businesses. In a rare show of bipartisanship, the bill received a unanimous vote from the committee and will now be voted on by the House. The US Senate introduced a similar measure last week. The bill will, among other things, raise the age for required mandatory distributions to 72 from 70.5 and repeal the maximum age for IRA contributions. US stocks recorded solid gains for the week, moving the large-cap indexes within about 2% of the all-time highs they established in September 2018. As of Friday, the S&P 500 Index had recorded seven consecutive days of gains, its longest winning streak since 2017. Trading volumes were generally light as investors awaited the arrival of the first major first-quarter earnings reports the following week. Within the S&P 500, materials shares performed best. The larger financials sector also outperformed, helped by a rise longer-term interest rates and the prospect of improved lending margins for banks. Consumer discretionary stocks were strong as well, bolstered by a rise in Home Depot shares. The typically defensive utilities and consumer staples segments lagged. Longer-term bond yields rose a bit over the week. The increase helped return the yield curve to an upward slope over the three-month to 10-year range, an inversion in the curve the previous week had been a source of concern to some investors given that such patterns often signal a coming recession. Rising yields also took a toll on municipal bond prices, although new deals continued to receive strong interest. The biggest event is likely to be the release of the FOMC minutes from the March meeting, where the Fed made another dovish shift, which, however, is probably not a significant market mover. US CPI core, which is due out Wednesday, likely rose +0.2% month-on-month in March implying an unchanged annual inflation rate at 2.1% year-on-year. Given the weak German factory orders in February, the equivalent data for the US, which will be released on Monday, may be interesting to follow. Having already extended the Article 50 negotiating period by two weeks, the British Parliament is no closer to a Brexit resolution than it was prior to the delay. Scheduled for Wednesday is a European Council emergency summit to deal with Prime Minister Theresa May’s latest request for an extension, through 30 June. The European Union is reluctant to grant a short extension, however, because of European Parliamentary elections next month. The EU would rather the United Kingdom seek a long extension, with an option for the country to leave early once the two sides agree on a way forward, which would force the UK to take part in the vote. A key measure of employers’ labor costs in Britain rose by the most in five years in late 2018, adding to inflation pressures that the Bank of England has said will need to be offset by higher interest rates. Unit labor costs rose by an annual 3.1% in the final three months of 2018, the Office for National Statistics said, up from 2.9% in the previous three-month period and the biggest increase since late 2013. British employers have been increasing their pay for workers at the fastest pace in a decade as they try to hire and retain staff with the unemployment rate at its lowest since the 1970s. British house price growth cooled in the first three months of 2019 in annual terms and the outlook is likely to remain subdued, given Brexit uncertainty and high property prices, mortgage lender Halifax said on Friday. Compared with the same period of last year, prices rose by 2.6%, slower than a rise of 2.8% in the three months to February. A Reuters poll of economists had pointed to an annual rise of 2.3% for the first quarter. 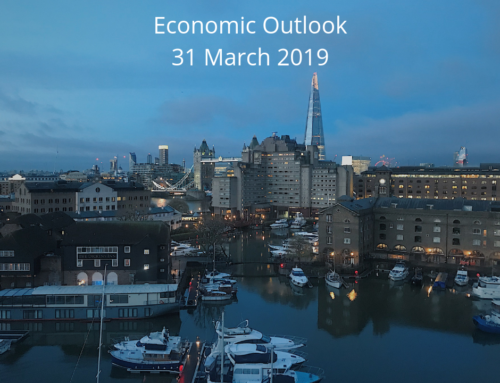 On Wednesday, the monthly UK GDP index for February is due out. Without going into too much detail, PMIs suggest growth was weak in Q1 and GDP is expected to grow by just 0.1% month-on-month in February. German manufacturing orders declined sharply in February, dropping 4.2% amid a slump in foreign demand, according to data from the federal statistics office. This is the fastest pace of decline since the 2008 financial crisis, with the sector under pressure from a slowing global economy and Brexit uncertainty. Other bad news also piled up for Europe’s largest economy. Leading economic institutes cut their 2019 growth forecast for Germany. On the bright side, German industrial production surprised to the upside thanks to a surge in construction activity; manufacturing production dipped, however. Germany’s economic ministry said that the sector is expected to remain subdued given the weak orders and business climate. European stocks rose for the week as encouraging Chinese economic data and hopes that the US and China are moving closer to a trade agreement overshadowed downbeat regional data and ongoing Brexit uncertainty. The pan-European STOXX 600 Index rose 2.4%, the German DAX gained more than 4.0%, and the UK’s FTSE 100 Index gained 2.3%. In the euro area, the focus is on the ECB meeting on Wednesday. Draghi is expected to repeat his ‘delayed, not derailed’ message from last week, so no new policy signals from the ECB. However, Draghi is also expected to strike an overall cautious tone and the ECB to keep its downside risk assessment on growth. The ECB’s Survey of Professional Forecasts will be released on Thursday. The degree to which longer-term inflation expectations have been revised down is to be closely scrutinized. On Friday, the February industrial production numbers are out and it will be interesting to see whether they fall in line with the PMIs or continue January’s rebound. Purchasing managers’ indices released this week show that both the manufacturing and services sectors of the Chinese economy showed signs of improvement in March. China’s composite PMI, which combines both manufacturing and service sector PMIS, rose to 54.0 last month, a jump of 1.6 points from February. Global markets breathed a sigh of relief, hopeful that past targeted stimulus efforts by Chinese authorities are beginning to bear fruit. China’s Vice Premier Liu He met US President Donald Trump at the White House on Thursday, stirring hopes that the meeting would lead to news of a summit between Trump and his Chinese counterpart Xi Jinping. Those hopes were dashed, however, when US Trade Representative Robert Lighthizer cautioned Thursday that both sides still had to resolve major issues before an agreement, and Trump said that any deal was probably still weeks away. Despite the latest developments, both sides are reportedly keen to reach a deal by the end of April to avert extending a trade battle that is increasingly weighing on the world economy. Mainland Chinese stock markets surged in a holiday-shortened week amid signs that the US and China were in the final stages of hammering out a deal to end their yearlong trade dispute. For the week ended Thursday, the Shanghai Composite Index climbed roughly 5.0% while the large-cap CSI 300 Index, considered China’s blue chip benchmark, rallied 4.9%. Both indexes ended Thursday at their highest levels since March 2018. China’s financial markets were closed on Friday, April 5, for the Ching Ming Festival holiday. On the data front exports will be in focus. Exports dropped sharply in February but the uncertainty around the Chinese New Year was probably an important factor. Early indications for March in PMI point to a decent rebound. PPI inflation will also be released and expected to show a small increase from 0.1% in February to 0.4% in March.